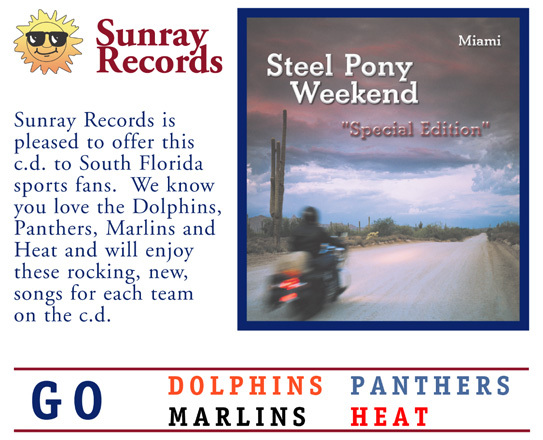 Sunray Records, Inc. has just released their latest C.D., Steel Pony Weekend, “Special Edition” Miami. It is available through our Ordering C.D. 's page. We believe the title cut is the best motorcycle rock anthem to come along since Born To Be Wild. As such, we are having a great contest where lucky purchasers of the c.d. can win either a new Can-Am Spyder RT-S three wheeled motorcycle or $25,000.00 in cash. To learn about that, go to our Bike Contest Rules page. Also, this c.d. has rocking, new, songs for the Miami Dolphins, Florida Panthers, Florida Marlins, and Miami Heat; so, if you're a South Florida sports fan, you'll want to have this c.d. And ladies, this isn't just a c.d. for the guys. Also on the c.d. are great new songs from J.D. Danner and Dangerous Betty, aka Beth Cohen. They are two of South Florida's rising female rock artists. By the way. We have recorded all 32 versions of the football song as well as 30 versions of the baseball song. Our goal is to make a Steel Pony Weekend, "Special Edition" c.d. for each of the teams. So, check back with us to see which ones become available.